We provide disposable catheter devices with electrodes for diagnosis and treatment of arrhythmias. This is catheter with attached electrodes provides specific information on intercardiac stimulus conductivity pathways and indicates irregular pulse origin areas. This is catheter with attached electrodes designed to correct stimulus conductivity pathways by cauterizing a pinpoint area with a high frequency current. It is a kind of ablation catheter. There is a hole to emit saline at the tip of the catheter that enables cauterizing while cooling the tip of the electrode, consequently the risk of blood clots in the body is reduced. 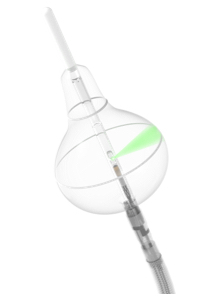 This is a balloon based ablation catheter with a reusable endoscope inside to enhance efficiency and safety. The primary target treatment area for atrial fibrillation is in the proximity of the pulmonary veins. The balloon catheter is deployed to make contact with the myocardium near that area and titratable laser energy is delivered to treat the arrhythmia (atrial fibrillation) under direct visualization using the endoscope. Catheter ablation for atrial fibrillation contains a higher risk of complications compared to other ablations. In order to prevent the occurrence of complications such as esophageal fistula penetrating left atrial and esophagus that has particularly high mortality rate, esophagitis, and esophageal ulcer, this catheter continuously monitor the temperature of esophageal. It is a system to stop atrial fibrillation occurred during the ablation treatment by performing defibrillation from inside the heart. Defibrillation from inside the heart is effective with low energy consumption and more minimally invasive compared to the defibrillation from outside the body. This system performs defibrillation by transmitting the electrical energy generated by the generator to the heart through a dedicated catheter. This device uses radio-frequency energy to open a hole in the interatrial septum. Copyright © Japan Lifeline Co., Ltd. All Rights Reserved.